Carnival Spirit has six options for free dining, which is quite a wide selection. Three new free eateries were added to the ship in August 2015. 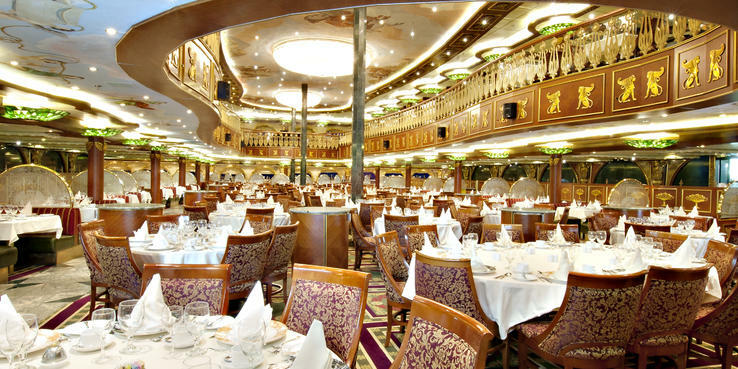 Empire Restaurant (Decks 2 and 3): The 1,300-seat, two-deck Empire Restaurant has an over-the-top splendour, with ceiling domes painted with murals and hung with crystal chandeliers. Even the large portholes are trimmed in gold, and the grand circular staircase is decorated with a sculpture of Napoleon at his coronation. Flanking the entrances are pilasters in the form of female statues. Passengers can opt for assigned tables at one of two dinner sittings (5:30 p.m. and 7:45 p.m.) or choose Your Time Dining, open-seating on the starboard side of the upper level, anytime from 5:30 p.m. until 9 p.m. There are tables for two, four and six, but fewer than usual for eight or more. Menus consist of starters (entrees, soups and salads), main meals and desserts, with healthier Spa Carnival choices and always-available Carnival Classics dishes such as Caesar salad, French fries, and grilled fillet of fish, grilled chicken breast and steak. Vegetarian items are always on the menu, but they aren't marked; be warned that the hot soups are typically made with chicken broth. Vegans and others with dietary requirement are catered for; on my cruise my vegan companion was well looked after. Food quality at dinner ranged from good to excellent. Waiters provide song-and-dance entertainment in the dining room most nights and patrons seem to love it, twirling their napkins and sometimes getting up to join in the dancing. Newcomers look a little bemused but soon get into the swing of it. An open seating breakfast is served from 8 a.m. until 10 a.m. on Deck 2 only and a Sea Day Brunch has been introduced for days at sea. This takes place from 8:30 a.m. until 1 p.m. and replaces breakfast and lunch in the dining room. This is perfect for late risers or those who want an early lunch away from the hot sun and the buffet restaurant. The menu consists of breakfast items such as omelettes and eggs to order, as well as some interesting options such as "Hey Pork Chop," a thick-cut chop served with caramelised onions, Gorgonzola cheese and a side of chips and beans. Fruit platters, French toast and Caesar salads are also available. A Bloody Mary bar is set up for people to choose their own ingredients, from vodka to tequila (bar prices apply). Afternoon tea is held in the Empire Restaurant daily for an hour from 3 p.m. although you have to call ahead and book earlier that day. Waiters serve the usual small sandwiches and cakes to individual diners. La Playa Grille (Deck 9): This buffet occupies a large area on the Lido Deck between the main Dome pool and the adults-only Serenity retreat. There are 10 food stations serving a variety of food for lunch and dinner including Asian, carvery meats, deli sandwiches, pies and wraps, salads and desserts. The pizza and ice cream bars, which are found inside this eatery, are open 24 hours. Breakfast includes a made-to-order omelette station, in addition to typical pastries, fruits, cereals and hot items such as pancakes and bacon. Breakfast pizzas, topped with poached eggs and spinach, can also be made in 10 minutes from the Pirate Pizza counter. BlueIguana Cantina (Deck 9): This Mexican-style cantina around the main midship pool is open from 7:30 a.m. until 10:30 a.m., offering breakfast burritos and huevos rancheros, and in the afternoon from noon to 2:30 p.m. Lunch options include a range of soft tacos with chicken, beef, fish and vegetarian fillings, and burritos with plenty of relishes, sauces and salsa to add to the mix. The food at BlueIguana Cantina is tasty and quite substantial. Guy's Burger Joint (Deck 9): This open-air hamburger bar is located just a few metres from the cantina. This American-style burger joint is named after U.S chef, restaurateur and TV's Food Network personality Guy Fieri. Apart from the usual burger offerings, Fieri has created the Boomerang Burger, which has Australians' must-have ingredient: beetroot. But rather than adding a few slices of the canned stuff, this burger features a more refined beetroot relish together with Fieri's signature Donkey Sauce (a blend of tomato relish and aioli). It's not listed on the menu so you have to ask for it. Guy's Burger Joint is open from noon to 6 p.m. Fat Jimmy's C-Side BBQ (Deck 10): Directly above the pool deck is this outdoor barbecue serving sizzling Black Angus beef sausages, smoked chicken breast, pulled-pork sandwiches, salads, jacket potatoes, grilled onion rings, mixed greens and other roast vegies. Don't miss the pork, which is bursting with flavour and slightly spicy, or the beetroot salad with feta cheese. The tantalising smells waft over the top deck at lunchtime. Open from noon to 2:30 p.m. There are four alternate dining options charging a fee. The variety is terrific and all are very good, particularly Bonsai Sushi, Nouveau and the Chef's Table, which are an outstanding value for the money. Bonsai Sushi 2 (Deck 2); a la carte pricing: This Japanese venue is a winner, serving fresh food at reasonable prices. Servings are large and designed to be shared. Starters, priced at just AU$5, such as Wagyu Kakuni (braised Wagyu short ribs with caramelised onion) are delicious; miso soup and noodle salad are AU$3 each and a large California roll (which is about 10 small pieces) is AU$6. A bento box of soup, side salad, three pieces of sushi and California roll is $12. There are two desserts (a green tea cupcake and yuzu custard) at AU$2, Japanese beers (AU$7.50), wines (from AU9 a glass, AU$35 bottle) and sake. Bonsai Sushi is open for lunch (noon to 2:30 p.m.) and again from 5 p.m. to midnight. Items can also be ordered to your cabin via room service. Coffee Bar (Deck 2): Just outside the RedFrog Pub is a kiosk for those who like good coffee -- the baristas are Australian-trained and can whip up a flat white, long black, latte and cappuccino in no time. There are also cakes on offer, all at a reasonable price. Seafood Corner (Deck 9): Previously known as Freshie's Corner, this new venue was added in January 2017. A smaller version of the Seafood Shack found on Carnival ships overseas, Spirit's Seafood Corner is open from 4 p.m. until 11 p.m. (Earlier in the day, it is used as one of the food stations in the Lido buffet.) Much of the seafood (except calamari) is sourced from Sydney's fish markets at the beginning of each cruise, so you should eat here on the first day or two to get the daily catch at its freshest. We tried it on the fifth day of our cruise and it was still delicious. The menu includes fish'n'chips, lobster rolls, seafood platters, local prawns, oysters and fresh whole fish (barramundi, snapper and flounder). Nouveau Restaurant (Deck 10); AU$45 per adult; AU$12 per child: The reservations-only, 152-seat Nouveau Restaurant at the top of the ship features aged prime beef cooked to order, classic dishes such as surf and turf (beef and lobster tail), lamb chops, grilled fish and lobster ravioli. There are also some 17 gourmet appetisers, entrees, soups, salads and desserts to choose from to make up a superb meal. Highlights include escargots, tuna tartare, lobster bisque and crab cake. We ordered all the sides: mash with wasabi horseradish, creamed spinach, steamed broccoli, mushrooms and baked potato with all the trimmings. The cuts of meat are plump, juicy and attractively decorated with sprigs of rosemary. Sizes vary from a small filet mignon to a big, thick, half-kilo of scotch fillet. The surf 'n' turf is a perfect combo of steak and lobster tail. The service is excellent, the wait staff 'know their meat' and the sommelier will walk you through the wine list and help you choose the perfect vintage. At AU$44 for four courses (plus the cost of your drinks), it's a fantastic deal. The restaurant has its own bar, which is the perfect place for pre- and post-dinner drinks. Many of the officers also use this bar after their shift as it is tucked away from view. Nouveau is entered via lifts or via a somewhat scary glass staircase. It's OK walking up, but going down the see-through stairs is a little disconcerting, especially after a few drinks. Also in Nouveau, on the last day with no ports of call, is the Long Lunch at Sea. For AU$30 per adult, four courses are served (entree, soup or salad, main and dessert) while you enjoy a lazy afternoon of great food and service. Dishes include spatchcock, spaghetti with clams, duck breast, Wagyu burger and mushroom cappuccino with truffle oil. A generous cheese platter, coconut flan and raspberry and dark chocolate dessert are among the sweet endings. Add AU$20 for a 75ml glass of wine paired with each course. Chef's Table (Deck 2): This wonderful degustation begins in the atrium with a glass of Champagne, before moving to the main galley for a tour with the executive chef or sous chef. Guests then stand around a table, watching all the action, and enjoying appetisers such as little cornets of salmon tartare, double-cooked lamb, and beef carpaccio on an air pillow with curly ribbons of apple. A mango sphere, delicately created to look like an egg yolk, bursts in the mouth. This part of the experience can be a little noisy as the pots and pans clunk away in the background but it's all part of the fun. The group then proceeds to Dancin' Nightclub where a beautifully decorated table has been set up under the mirror ball and disco lights (which are subdued). Here, another seven dishes, many prepared using molecular gastronomy methods, are served on elegant crockery on a table with exquisite decorations. Dishes may include blue swimmer crab stack, duck textures, tomato bisque and barramundi, but make sure you save some space for the Wagyu beef with bone marrow souffle. Dessert is likely to be a beautiful tasting plate of six sweet treats. If you can only fit in one, slice open the chocolate praline and scoop out the salty caramel centre. While each dish appears small, they are rich and many people may find it a struggle to get through it all. Don't eat lunch is the best advice. Free-flowing red and white wine are served throughout the sit-down meal, followed by tea and coffee. Everyone takes home a copy of the menu, a recipe for Carnival's famous warm chocolate melting cake, and a group photo taken before dinner. At AU$90 a head, this has to be one of the best deals on the high seas. Chef's Table is held a few times during a cruise, depending on demand, with 10 to 14 people on each occasion. Book it as soon as you get onboard and frock up for the occasion. Room Service: A 24-hour room service menu is available with items individually priced. The limited menu includes soup and salad at AU$4 per item; sandwiches, pies and pizza for AU$7; desserts for AU$4; and non-alcoholic beverages for AU$3. There is a separate room service continental breakfast, with items ranging from AU$3 for fruits and cereals to AU$4 for breakfast breads with spreads. Sushi can also be ordered to your cabin, priced from AU$6 to AU$8 for eight rolls. Full stateroom bar service is available from 9 a.m. until 3 a.m. at bar prices.